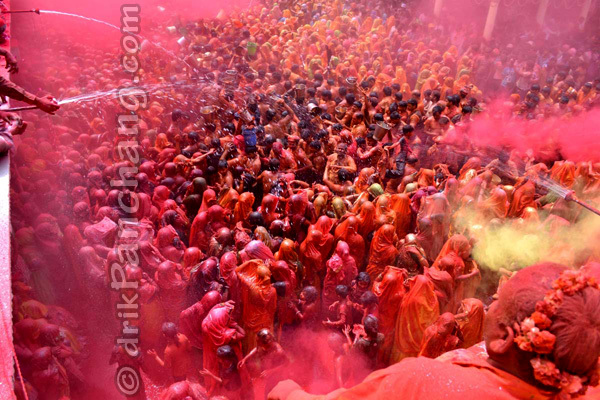 In most of the Brij region, Holi festivity was culminated on 27th March, the next day of Holika Dahan. However in Baldev town the most famous Huranga was organized on 28th March. This event is famously known as Dauji Huranga. According to Hindu calendar followed in North India, it was the first day of Chaitra month. Baldev is famous for being the birthplace of Lord Balarama. Lord Balarama was the elder brother of Lord Krishna and the 8th incarnation of Lord Vishnu. The sacrosanct Holi is played in the premises of Dauji temple. While Lathmar Holi of Barsana is played with bamboo sticks and leather shields, Dauji Huranga is played with torn clothes. During Holi Huranga women folks tear clothes of men folks and use them as hunter to beat men folks to resist their attempts of smearing women with colors. The event is organized ritualistically by the temple authorities.